This an interesting example of one designer influencing another. This washstand was designed by the English Arts & Crafts designer WR Lethaby, but is clearly based on earlier Wm Morris designs. The origins of Lethaby's design is the 'Artisan' bedroom range for Morris's Red House c1861 (shown in our Morris Furniture section) - see the green washstand below. 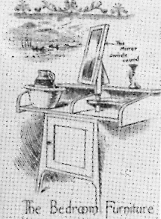 Morris produced some designs for a small workman's cottage in 1884, inc. the sketch below for a washstand. Lethaby's design is quite clearly an adaption of this Morris sketch. It was produced for Melsetter House, in the Orkneys, a house designed by Lethaby. We were given the measurements for this piece by the architect John Brandon-Jones. 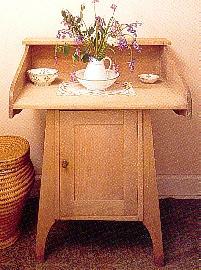 We could reproduce this washstand if requested, or produce any variation of it you like. made to order.